This was our Moon^Kilter hybrid board before the 55 Kilter holds arrived. Moonboards are awesome, and the online problem set is super fun and motivating. The app is a great way to share problems, and we really enjoy trying problems from folks around the world. However, Moonboards have four major shortcomings which the Moon^Kilter Hybrid Board solves. The T-Nut Grid is too sparse. Moonboards are good for training power, but not for warming up, PE or endurance work. Our hope is that our Moon^Kilter Hybrid can become a prototype that encourages Moon and Kilter to team up to create a board with an expanded grid, with more varied holds, and a wider range of problems. 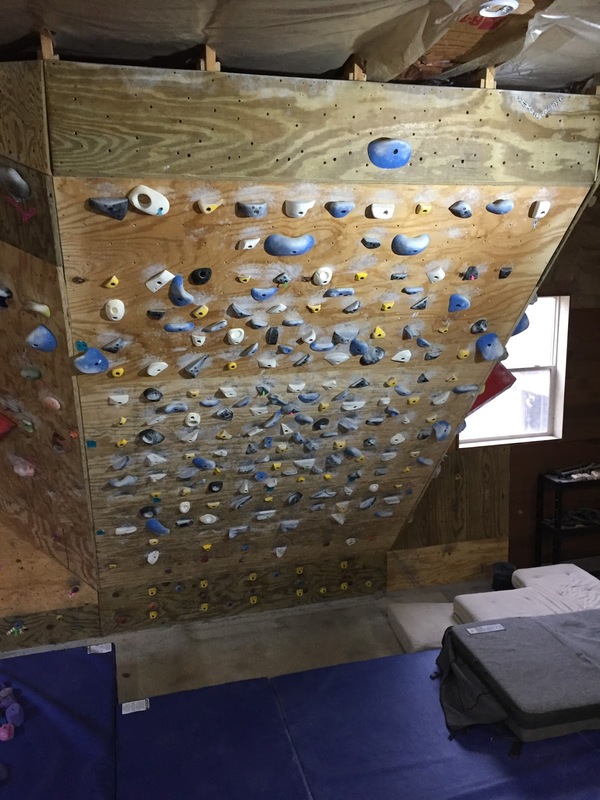 This will greatly expand the range of climbers who can enjoy the board, and the ways they can train on the board. Solution #1: The Moon^Kilter Hybrid adds 180 more t-nuts, centered in 12 columns, and 15 rows. You can see the holes centered in the moon grid here (pencil lines). Solution #2: The Hybrid adds awesome holds from Kilter that extend the variety of hold types without blocking access to other holds on the board. We are planning another group of sets in red for the "medium" difficulty. We will move the Noah Small 5 to the red medium group, and add another set each of Winter XL 1 and Winter Large 5 to the blue group. We plan to order the sets for the red group this fall. Solution #3: Create easier problems, with different types of holds and movements. Here is a photo of a climber on a V1 problem with any feet. Eventually it would be cool to be able to include the additional holds and problems into the app with options for foothold restrictions, wider grade range and problem types. Solution #4: The Moon/Kilter Hybrid board is much better than the standard Moonboard for training. We can do all of the power problems we want using the standard Moon problems, but we can add in power problems with slopers, rounded edges and small incuts and pinches. But we can also warm up on comfortable jug hauls, develop power endurance cycles, or hop on the board for 50 move endurance rigs. We can practice giant cranks from juggy underclings, and latch slopey dynos on smooth jugs. Big thanks from Syd and all of us at Betafish/Climb Athens to Tony Reynaldo at Kinetic Climbing and Fitness for hooking us up with a great deal on a ton of "pre-experienced" holds. Thanks for this great post. We just recently built a Moonboard and thankfully I saw this post before we put it up so we added the same t-nut grid you used and it's been great to have more hold options on the board. Hey Jason- That is awesome. Glad you are happy with the extra t-nuts. 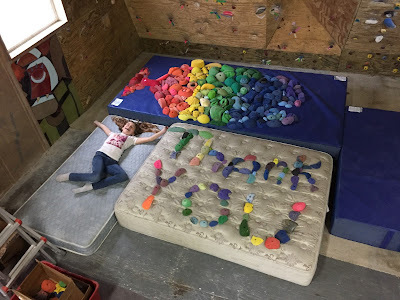 It makes a huge difference for us-- we can have fun V1/2 problems with bigger holds and they do not get in the way of the harder options. If you are ever heading to Athens let us know at the Climb Athens FB page. Have you figured out a pattern that works well for adding those holds? I am building one of these for a summer camp and like the idea of being able to replicate the routes across the board and having a way to make route sharing more uniform and repeatable, like the moonboard. We would need to number and decide on a direction description for each hold. The moon holds are all stamped with a number which also serves as a marker that you position in directions (north, south, northwest, etc). The Kilter holds do not have those. We could document how ours are set up in photos and or a video, and share that. After that, we could use instagram and a specific hashtag to indicate problems. That would a pretty easy way to get problem sharing started. I'm sort of interested in this as well although I may include the red set... I can send you a 'map' of the spaces left over and it might be good to collaborate on a canonical mixture? How are you liking the setup now that it has been up for a while? Get up for the down climb. . . everybody get up. I teach sociology at Ohio University, study social processes and computer mediated interaction, and create blogs relating to the classes I teach, the things I study, and the things I do.